The Heart Symbol tells the consumer at a glance that the product marked with this symbol is a better choice in its product group. The criteria are regularly updated, if needed, by the Heart Symbol expert group, which includes eight professionals in nutrition and medicine appointed by the organisations in charge, i.e. FHA and FDA. How to get Heart Symbol? To be able to carry the Heart Symbol, food companies need to apply for the right to use the symbol for products that comply with the defined food-category based criteria. The rights are granted by the organisations in charge based on decisions made by the expert group, which considers the applications together with the questions related to continuously controlling the validity of the products. Since 2000 FHA and FDA have worked heavily for making the Heart Symbol known by the public. Brochures have been printed for different target groups, the system has its own homepage and there have been multiple advertising campaigns in different media. Especially, companies are encouraged to use Heart Symbol in marketing their own products with the symbol. Currently more than 1000 products on the Finnish market have the right to carry the symbol. The right to use the Heart Symbol is subject to an annual fee (500 euros per product). The more a company has products with the Heart Symbol, the smaller the costs per product will be. Micro-enterprises will get the biggest discount (-60%) from the standard fee. The Heart Symbol system is non-profit. The fees collected are currently the only source of funding for the system. The fees are used to keep up the system, including e.g. spot checks to control that the nutritional content of the product with the Heart Symbol corresponds to the criteria for using the symbol. Over the years, surveys have been carried out to examine consumers’ awareness of the Heart Symbol. 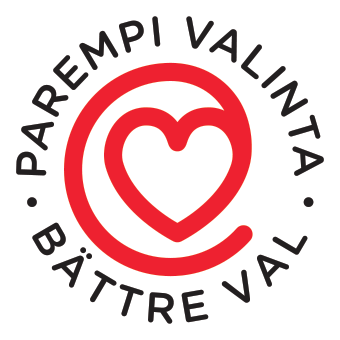 Questions on the Heart Symbol have been included in annual nationally representative cross-sectional population surveys on Health Behaviour and Health among the Finnish Adults since 2001. According to the most recent survey (year 2012), 72 % of men and 92 % of women aged 15-64 years reported to be familiar with the symbol. Sixty percent of men and 75 % of women reported that they have used such products over the past year. To increase the knowhow of food service employees about improving the nutritional quality of the food they prepare and to increase the demand for healthier meals, FHA has developed tools for monitoring and improving the food quality. For that purpose, in 2008, Heart Symbol system was expanded to cover also meals served outside home. The criteria for Heart Symbol meals in a main course include the content of energy, fat and salt together with fat quality. In addition, green salad or fresh vegetables with oil-based dressing, low-salt and high-fibre bread with margarine and non-fat milk or sour milk should always be available for consumers. To help consumers to make better choices, all parts of the Heart Symbol meals should be marked with the symbol on buffet. Furthermore, a model meal should be on view for the consumers to guide them towards a balanced meal with reasonable portion sizes.